Mr. K's class was having a Christmas Craft-a-rama day last week. They asked for parent volunteers to each create a craft that we could make with the kids in the class. The only guidelines really given were that it should be simple and with little to no cutting involved. Mr. K has been wanting me in his class all year, and this was the first time I had been asked to come in. I thought a lot about what I could make (I am not super crafty when it comes to this) and decided that making candy cane ornaments for the tree would be a great idea. 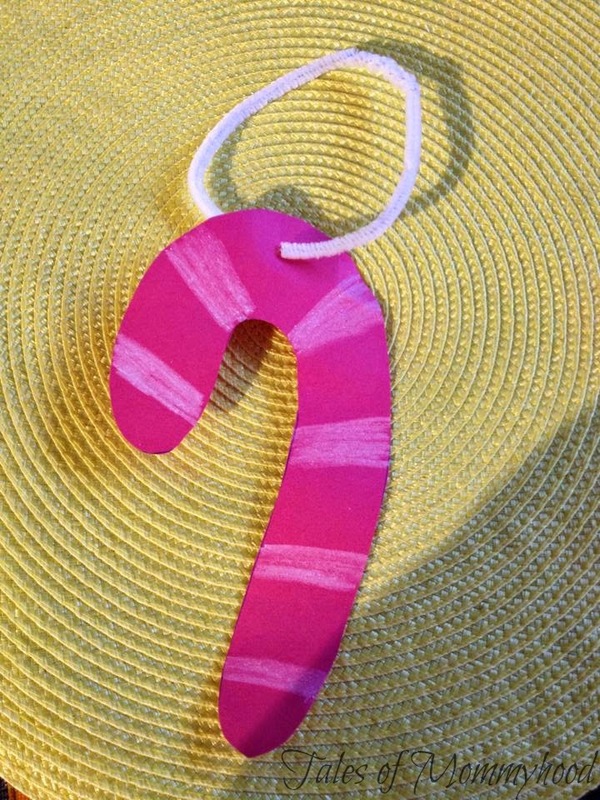 I cut out a sample candy cane from red construction paper, then I took a white crayon and coloured stripes. I had white pipe cleaners to put through the top of the candy cane and twist together to make a circle so they could be hung on the tree. I poked a small hole in each shape so they could put the pipe cleaner through without ripping the paper. I had white paint for them and paint brushes that they could use to paint on their stripes. Some kids painted thick stripes, others had thin ones. Some painted the whole thing white. I had so much fun, the other crafts that were available were: cinnamon scented pine cone ornaments, painted with red. green or white and then sprinkles added. Styrofoam cup bells; pipe cleaner snow flakes; pipe cleaner candy canes or caterpillars.